Andrew’s thoughts: Coming into the 2016 season, David Peralta was one of my favorite players. He broke out in a massive way the season prior, posting a .380 wOBA, which was good for a 12th in all of baseball. He only had a .299 wOBA against LHP, so he was still a platoon option, but at least he was destroying RHP. His batted ball profile also looked great: a meager 13.3% soft hit rate flanked by a 35.4% hard hit rate. Only 30 players hit balls harder than Peralta in 2015. All that said, 2016 was a disaster. He came to the plate only 183 times and his wOBA dipped to a replacement level-like .308. Worse, while he got it up to .306 against LHP, his wOBA versus RHP plummeted to .309. But most of his pitfalls last year can be attributed to injury. His wrist ailed him all year and he eventually had surgery in August, which is the easiest explanation of what went wrong. As a $19 bet for 2019, you could do a lot worse than Peralta. That salary is obviously way too much for a guy with a wRC+ of 84, as he hit last year. But a wRC+ of 137 like he did in 2015? Or even a 109 like he had in 2014? For $19, you’ll take it. But while Peralta has easy excuses for his poor 2016, Zack Greinke really doesn’t. He had the oblique injury, but he did his DL stint and came back from it. He moved from Los Angeles to Arizona and that obviously hurt him. At home last year, Greinke pitched to a 4.35 FIP, a 4.54 xFIP, and had a K-BB% of 8.9%. Peralta’s injuries can heal. Only a trade can rescue Greinke from hitter’s park purgatory. But even away from home, Greinke wasn’t his usual self. His road FIP was 3.88 and he gave up bombs at a 1.46 HR/9 clip. You put all these things together and you’re looking at a replacement level type pitcher. Prior to 2016 though, Greinke was one of the premier starting pitchers in baseball. His $78 salary last year was perfectly fine. He’d had seven straight seasons where he posted a FIP of 3.34 or lower. So in trading for an $80 pitcher with Greinke’s history, TBD is taking a rather expensive gamble that last year was a fluke. And I don’t hate that gamble. Even as bad as Greinke’s numbers looked, he still averaged 24.81 fantasy points per start. This is because he’s on the depth chart as an ace, he’s paid to be an ace, and so he’s managed like an ace. A rotation’s fourth starter may struggle through four or five innings and get pulled, but that won’t happen to Greinke often. He’ll stay in and grind through six or seven innings. His floor is pretty safe. 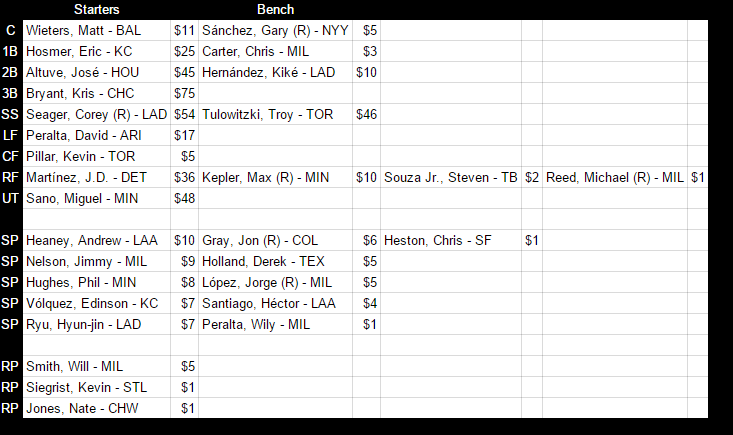 And while ideally, yes, you want $80 of value or more from a guy you’re paying $80 to, TBD can sort of justify Greinke just being an expensive safety valve with colossal upside when they’ve also got a $4 Tanner Roark, a $8 Jon Gray, and a $5 Steven Wright. Looking at it through that lens, you’re investing $97 in four pitchers ($24.25/each). And if Greinke struggles against in 2017, oh well, just cut him next year. For the short term though, I count six players, including Greinke, with $409 worth of salary — and that’s pre-greed allocation. So this is setting up be the stars-iest and scrubs-iest roster of them all. I think this trade makes sense for both sides. Dusty absolutely had to dump salary and I can’t imagine many teams willing to give up anything significant for Greinke. TBD had been trying to sell Peralta for months, so clearly the market for him wasn’t strong. It’s very obvious that both of these players, given their 2016 seasons, are big time risks at their current salaries. So I also think you could very easily argue that both players should just be cut and sent back to auction. Jordan’s thoughts: My early projections still had Dusty keeping Greinke despite his poor 2016 campaign. Zack dipped down to his 2010-2011 levels of mediocre pitching. He has a well documented case of issues that aren’t related to his physical health which could be coming into to play here. He also has 2200 innings under his belt and could just be beginning his decline. There’s a lot of if’s surrounding Grienke. I still like him to bounce back to the good, but perhaps not great level of performance. He does seem to stay mostly healthy, so you should be able to count on him starting all season. If you can get 28 fantasy starts of 27 points per start out of a reliable starting pitcher, $80 isn’t really that much to ask. A high price sure, but not a terrible one. Giving up David Peralta here is not hard to do. He’s keepable at that salary, but its not a fun keeper in my opinion. Depending on how big the free agent auction pool will end up being this March, he could have probably gone for less than $10 or more than $30. Supply and demand is going to be an interesting experiment this off-season. I don’t love or hate this deal for either team. Fun trade!